Agroisolab GmbH has long term experience with the execution of government supported projects as well as private sector financed projects. These projects are R&D projects and, for example, projects aiming at larger data base building that constitute a regional, national and international basis for resolving certain types of problems. Development and recommendation for selected analytical methods to differ organic and conventional products. The Agroisolab GmbH is a spin-off the research center Jülich. As well as an excellent experienced team, Agroisolab GmbH also took over the Isotope-laboratory which was expanded in the course of time. In 2002, Agroisolab GmbH, together with its distribution partner and the research center Jülich, received the coveted Co-operation Food Processing Prizeof the State of Northrhine-Westphalia. The price is given to the most innovative and economically most sensible business co-operations in the agriculture industry. In front of this background R&D has remained an important part of Agroisolab GmbH. Its main focus lies in applied research. New, practice relevant application possibilities and new products like the designation system ISO-ID show that also in smaller businesses effective research results can be obtained within a comparatively short time. Agroisolab GmbH together with the Research Center Jülich holds several patents in the isotope-application and analytics. 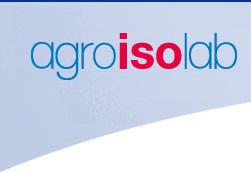 Therefore, Agroisolab GmbH is participating in different international ring tests.